Every once in awhile I stumble into an amazing genealogical find. This one pertains to my 2nd great grandfather from Germany, Peter Heinrich Ratz (1867-1934). I wrote about him a couple of years ago here: “Nothing but the choicest meats” - Henry Peter Ratz (1867-1935). Peter came to the United States with his family around 1880. I believe they first came to Wisconsin, then the Upper Peninsula of Michigan, and finally settled in Flint, Michigan. In the process of cleaning out some old boxes and files, my father came across a treasure trove of VERY old photos and documents that he didn’t even know that he had. In the collection was this 136 year old original handwritten (in German) document from 1883. I do not know German but I could make out a few of the names that fit with known information about our family’s history. I recognized the “Peter Heinrich Ratz” in the middle of the page. I have seen his name both as Peter Henry and Henry Peter. The year above his name, 1867, matched what I knew to be his birth year. I also could make out “Johan Ratz” and “Rosine Gramling” who I knew to be Peter’s parents (and my 3rd great grandparents). The “Johan Gramling” name was a bit puzzling because I do not have any other information on the Gramling branch in my tree. I wondered if this was a marriage certificate for Peter and his wife (my 2nd great grandmother), Fannie Schmidt Ratz (1870-1944), but I did not see her name anywhere on the document. Lastly, the dates were a little confounding to me. If this was an original birth record for Peter (1867) then it would not include the dates of 1876 and 1883 which are clearly visible on the document. I turned to the power of Facebook and the group that I have used several times before: Genealogy Translations. This was indeed an official copy of the Peter’s original baptism and birth certificate entry in the church register! I am thrilled to have this document and happy to share its story with you. Here are a couple of photographs of Peter. Here is a larger family photograph with Peter in the center wearing a dark driver cap and a bow tie. His wife, Fannie, is tucked in the very back behind him. I believe that is my great grandmother (and Peter’s daughter), Alma Ratz Hanley (1894-1979) on the far right. And Alma’s husband, my great grandfather, Michael John Hanley (1890-1964) in the back row, second in from the left. With a little sleuthing I could probably identify the rest in the photograph. John Gramling is listed as Peter’s godfather, but I have no record of him. Is this Rosine’s father? Brother? Cousin? Those are the most logical guesses. What can I learn about the different locations, districts, and parish listed in the birth and baptismal record? Why did Peter need this document copied when he was 16 years old? Was it for immigration purposes? Need some help telling your family's story? A group gathers for a 30th birthday party. Germany, 1929. When you discover a relative in your family tree nicknamed "Rabbit" you obviously have to find and tell his story. Here it is. 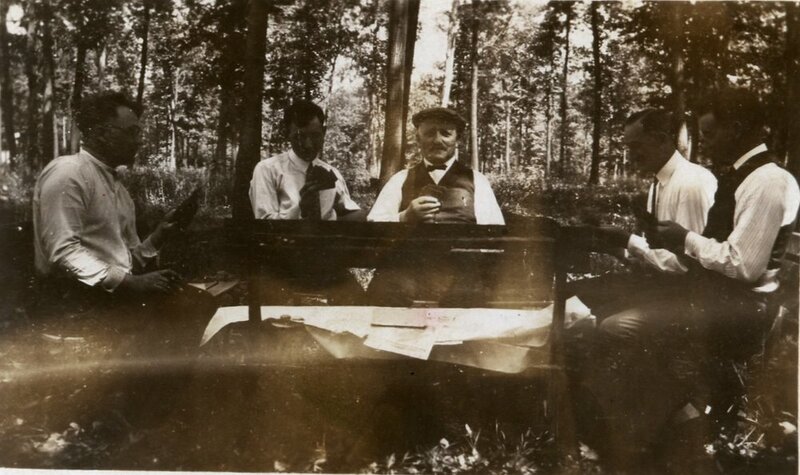 “To you, my dear good Walter” - 90 year old photograph of a 1927 engagement party Gorlitz, Germany. By all accounts Martha Zenner Muenzel (1868-1960) was a wonderful German cook. Some of her specialities were Kucken and Wickelklöße. She was likely my 1st cousin 4x removed. The is her story.